The Friends meet Guys and Dolls at Sonning…. 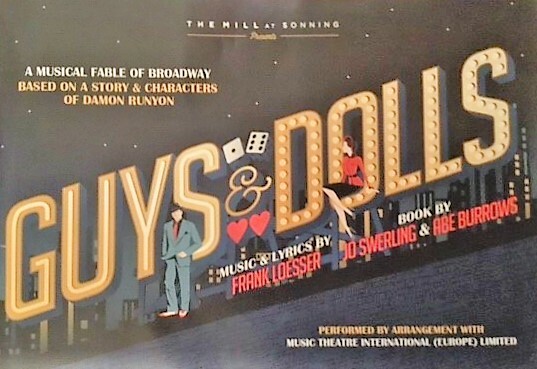 On Saturday 10th December a party of 49 Friends of Romsey Abbey travelled by coach to Sonning on Thames to see ‘Guys and Dolls’ at famous Mill at Sonning Theatre. After a welcome coffee in the bar and a chance to view the quaint surroundings and the turning Mill Wheel, a delicious 2-course buffet lunch was enjoyed in the beautiful oak-beamed dining room. The Friends then enjoyed the best seats in the house, in the intimate 215 seat Theatre. The production of the American musical ‘Guys and Dolls’ was sensational. “Superb, spectacular, professional, inspirational cast”, were some of the Friends’ many comments received after the show by the organisers Colin and Rosemary Davis. The Party returned satisfied and happy to Romsey in the early evening. One of the Friends remarked that it was a “splendid start to the festive season”. It was certainly a great way to relax and share companionship, conversation, enjoyment and happiness. The Friends’ programme for 2019 is being finalised and will be available in the New Year. One definite booking is on 29 April when we shall be continuing our popular series of boat trips with a luncheon cruise on the River Thames at Henley, coupled with a visit to the River & Rowing Museum. Please update your diary ………….